We’re exploring how growth and development could happen in a meaningful way at the Oakridge Co-op location. If you live, work, play or travel in the area, we want to hear from you. 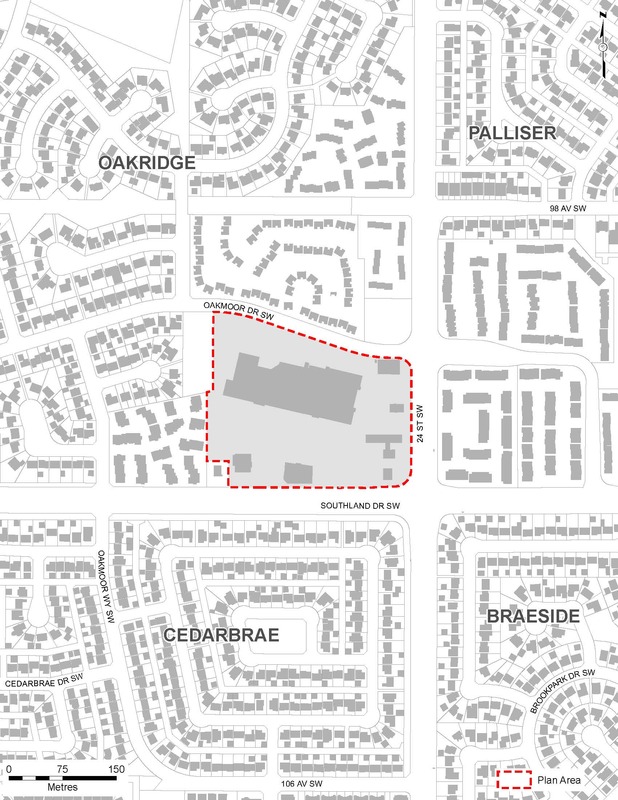 Co-op, in conjunction with Quarry Bay Developments, proposed a combined development permit and land use redesignation (re-zoning) for the site located at 2580 Southland Dr. S.W. (the existing Co-op site). The final development plan proposed four new buildings. The tallest building heights are proposed to be approximately 12 storeys (44 metres) and 6 storeys (26.5 metres). A total of 249 residential units were proposed and approximately 154,000 square feet commercial space including office, grocery store, retail, existing restaurants, liquor store, gas bar and other commercial uses and 686 parking stalls. The land use amendment application (LOC2016-0330) was submitted to redesignate the property from C-C2f0.32h16 to a Direct Control designation that would be based on the C-C2 designation. The land use amendment was presented to Calgary Planning Commission (CPC) on November 16, 2017. CPC recommended the application for approval by City Council. The Oakridge Co-op land use application was given first reading by Council on January 22, 2018. Council will withhold second and third reading of the bylaw, pending the decision on the development permit (DP2016-5076) by CPC, along with further discussions between Administration, the applicant and the local Councillor. The Development Permit was presented to CPC on April 19, 2018 and was approved. Note: It is Co-op's intent to redevelop the site in phases, keeping the current Co-op store and existing businesses open until each replacement space is built. Co-op also intends to keep an adequate level of parking available for customer use during the construction period. Below is the area being considered as part of this land use amendment application. Below is an image of the final development concept submitted by the applicant. No. The existing Co-op grocery store will remain open and operational until the new store is completed and ready to open. There will be no disruption to the operations of the existing Co-op grocery store. Is the new Co-op going to be bigger? The new Co-op grocery store is proposed to be approximately 53,000 square feet, while the current store is approximately 75,000 square feet. Co-op has indicated that the design of the existing store is inefficient and that the new store will operate more efficiently at the proposed size. What is happening to the existing restaurants and businesses? Are they closing? Many of the existing businesses on the site have long-term leases and will remain open. Some of these businesses will be relocated within the site (such as those currently in the existing mall), while other businesses are proposed to continue operating in their current locations (Boston Pizza, Co-op Liquor Store and A&W). Are the developers taking a phased approach to development? Yes, the development is proposed to incorporate several phases. The first phase involves the construction of a new medical and commercial building on the west end of the site that will serve to relocate existing mall tenants. Phase two involves the renovation of the mall for the new Co-op grocery store. Phase three will see the new Co-op store open and demolition of the existing store. Construction will begin on a residential building, parkade and commercial stores in place of the existing store. Lastly, construction will begin on a residential building, parkade and commercial stores in place of the existing Co-op. How high will the residential buildings be? The new buildings incorporate a range of proposed heights. The tallest building is located adjacent to the new Co-op (approximately at the main entrance of the existing Co-op) and will have a maximum height of 12 storeys (44 metres), but will taper down in height to 4 storeys adjacent to Oakmoor Drive. The second tallest building is proposed to be 6 storeys (26.5 metres) and is located on the western portion of the site. How many residential units will there be? The development is proposing a total of 249 residential units. Are there going to be any improvements to existing street parking? No changes to street parking are planned at this time. There is existing parking on Oakmoor Drive and Oakmoor Way that will stay as is. Where is the Bus Rapid Transit (BRT) going? Southbound 24 Street @ Southland Drive S.W. Eastbound Southland Drive @ 24 Street S.W. Learn more about the Southwest Bus Rapid Transit system. Does Southland Drive connect to the Ring Road? Southland Drive will connect to the Ring Road at the intersection of 90 Avenue S.W. Southland Drive will be widened from the intersection of Oakmoor Way to the west. The graphic below illustrates how Southland Drive will connect to the Ring Road. Learn more about the Southwest Ring Road. Access to 24 Street S.W. from Oakmoor Drive (the road directly behind the existing Co-op) is a concern. How is The City going to address this? To address the congestion and access concerns, The City requested that the developer complete a transportation review. The review is complete and traffic signalization and consolidation of the pedestrian island with the sidewalk are to be completed by the developer. Are there any details that can be shared about the residential component – such as what size the units will be? Will this be targeted for students, seniors, families or rentals? The residential units generally consist of one, two and three bedroom apartment suites. The majority of the units have two bedrooms or more. The target audiences are young professionals as well as seniors in the area looking to down size from their larger homes. Can you please explain how the parking allotment works? How many spots will be for residential versus commercial? A total of 686 stalls are provided on site. 383 stalls are provided on the surface for commercial parking, and 303 underground for residential and visitor parking. How many parking stalls exist on the site today? There are currently 696 parking stalls on the site. How does The City analyze traffic impacts with a development of this size? The City assesses traffic generated by the new development along with projected future traffic to see if nearby intersections can handle the added volume. The City also takes into consideration other development and roadway projects that will be happening in the future. Additionally, The City compares the level of congestion and delay against accepted industry standards to determine if any improvements are required to the roadway network. These improvements could include, but are not limited to: a change of signalization, introduction of a new traffic signal, addition of roadway lanes, improvements to transit or bicycling facilities, and restriction/removal of on-street parking. When upgrades are required, these are paid for by the developer. How is The City analyzing the impact of the Ring Road and other transportation projects in conjunction with this project? The Ring Road and other transportation projects (BRT, etc) are already accounted for in the ‘background’ data provided to the consultant for the traffic impact analysis and will be evaluated as part of our review. Is Co-op considering any environmental initiatives when building this development? Co-op is looking at several green initiatives including a Co-Gen system, green rooftops, rooftop greenhouse and a community greenspace. Building materials will also be energy efficient. Will the shadows from the buildings impact the surrounding development? Where will the shadows fall? Based on The City of Calgary’s criteria for shadow studies (between March 21 and April 21 from 10:00 am to 4:00 pm), no adjacent developments will be impacted by shadows from the development. Shadowing is limited to adjacent roads. What is a commercial main street? A commercial main street is a street that generally has commercial uses (shops, services, restaurants, cafes etc.) on both sides of the street and is walkable. Parking options are either parallel to the street, angle parking or surface lots located on the periphery of the commercial street so as not to block pedestrian access to the shops. Examples in Calgary include historic inner city streets such as 17 Avenue S.W., 33 Avenue S.W. (Marda Loop) or 9 Avenue S.E. in Inglewood, as well as in new communities such as McKenzie Towne or Aspen Landing. We have now completed our engagement for the Oakridge Co-op redevelopment application and you can view the final engagement summary here. Feedback received in all three phases of engagement has been used to inform the detailed review of the submission and the applicant has shared their final submission in response. Engagement results are also included in the reports shared with Calgary Planning Commission and Council. 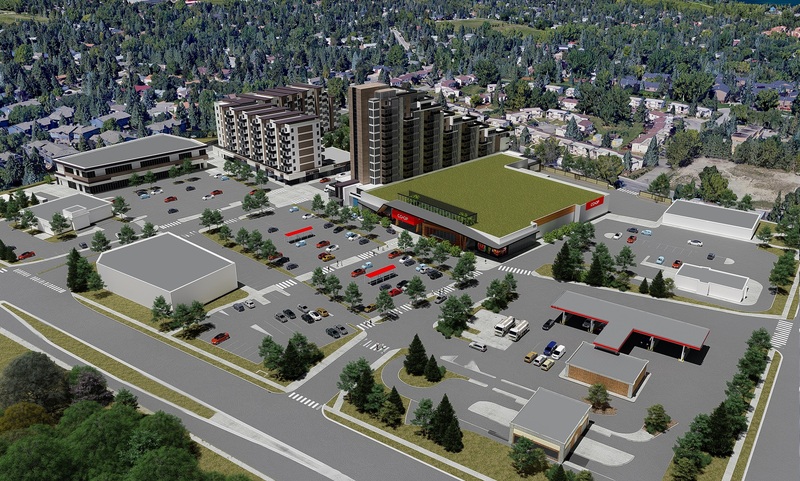 In August 2017, citizens were invited to provide feedback on a revised application for the Oakridge Co-Op redevelopment. This feedback was used to inform the second detailed review of the application and was shared with the applicant. To see what information was presented during our engagement sessions, please review these information panels. A summary of engagement and the feedback received during phase three are within the What We Heard Report. In May 2017, citizens were invited to participate in a visioning workshop. At these workshops, citizens completed a group exercise where a game board of the Oakridge site was used, and participants were able to lay down tiles that represented the various uses (grocery store, residential space, parking, gas bar, offices, medical clinics, etc.) to demonstrate what layout they think works best for the site. The purpose of this exercise was to delve deeper into the issues, opportunities and outcomes, and gather more detailed input into what the community would like to see in the development. To see what information was presented during the workshops, please review the presentation. A summary of feedback received and verbatim comments received during Phase Two are within the What We Heard Report. In February 2017 , citizens were invited to provide their feedback by attending an open house or going online and to share their ideas and concerns about the project. The feedback received from phase one of engagement was used to inform phase two of engagement and the first detailed review of the submission. To see the information panels that were shown at the open house, please click here. A summary of feedback received and verbatim comments received during Phase One are within the What We Heard Report. Initial team review: Application was accepted for circulation to affected agencies. Get the latest news, sign up for email updates.